Like many other currency pairs the future direction for the usd to cad depends to a great extent on the outcome of tomorrow’s NFP numbers and ECB interest rate decision. In the meantime today has seen the release of the ADP figures which have come in far worse than expected at -473k against a forecast of -388k which may well be a portent for tomorrow’s key number. Although the ADP is only estimate of the change in private sector jobs its has recently been a good indicator for the health of the economy as well as an early warning system for the NFP numbers. Today’s number confirms the number of jobs lost. Other items of fundamental news on the economic calendar for the US can be found on the main Eurodollar site whilst in Canada today is national holiday. 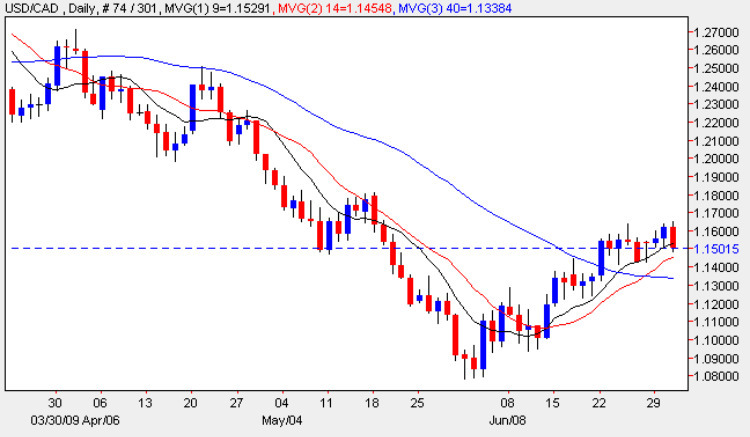 Technically yesterday’s small up bar on the usd to cad daily forex chart provided little in the way of any clear signal other than the low of the session found support once again at the 9 day moving average which suggests that the bearish momentum seen throughout June still remains intact. This could, of course, change in the next couple of days as the Dollar’s fate is set in train from the NFP numbers tomorrow along with FED and ECB policy for the next quarter.